Verizon on Tuesday revealed its quarterly earnings for the fourth quarter of 2011, in which it sold 7.7 million smartphones, 4.2 million of which were iPhones. Apple's strong performance in the holiday quarter was downplayed by Verizon, which preferred instead to focus on its high-speed 4G long-term evolution network. Verizon's official press release, "Investor Quarterly" publication and earnings results presentation slides made no mention of Apple or the iPhone. The carrier had already revealed earlier this month that it sold 4.2 million iPhones in the December quarter. Verizon's chief financial officer, Fran Shammo, attempted to deflect concern from some analysts on Tuesday that the high subsidy cost of the iPhone dragged down the carrier's wireless profits, according to CNN Money. Shammo said that high costs associated with subsidizing the iPhone are simply the price of doing business with Apple. And those costs gave Verizon 55 percent of its smartphone sales for the quarter, as most customers chose Apple's 3G iPhone versus the carrier's selection of 4G LTE phones. Verizon officials said they are happy with the 2.3 million 4G LTE devices that were activated in the last quarter. The company touted that it has made "significant advancement" in deploying its 4G LTE network, and is well ahead of the competition in that respect. "Verizon finished 2011 very strong, both in terms of revenue growth and by delivering an 18.2 percent total return to our shareholders for the full year, and the company has great momentum for 2012," said Lowell McAdam, Verizon chairman, president and chief executive officer. 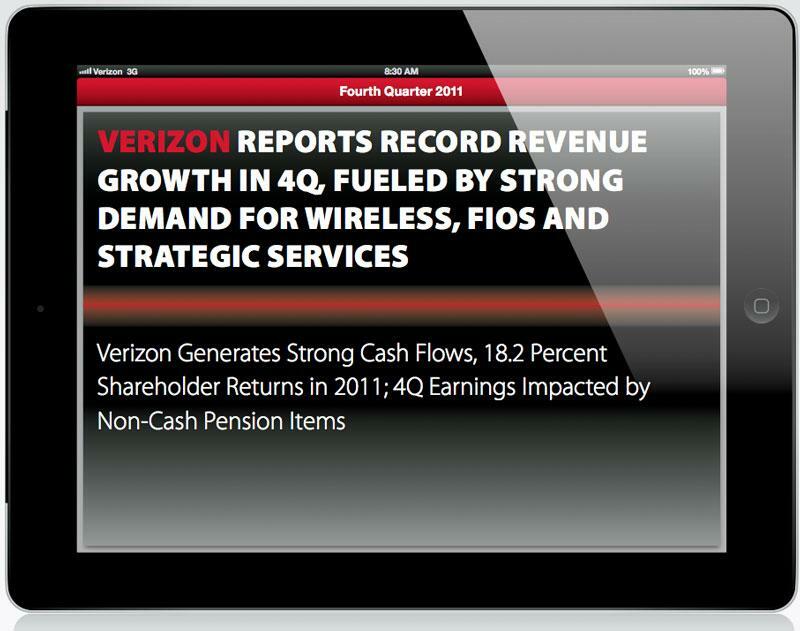 "Verizon Wireless produced particularly strong growth in the fourth quarter. While that diluted wireless margins in the short term, it is good news for revenue and margin growth over the long term, particularly given our leadership in the rapidly developing 4G LTE ecosystem." Verizon posted 7.7 percent year-over-year quarterly revenue growth in the fourth quarter of 2011, which was a record for the company. Its wireless business had $18.3 billion in total revenues for the quarter, up 13 percent from the same holiday period in 2010. While the carrier's press materials and news releases didn't mention Apple, its quarterly bulletin publication did lead off with an illustration of a 3G-connected iPad touting its record revenue growth in the fourth quarter. Verizon is the largest wireless carrier in the U.S., and its chief rival is second-place AT&T, which announced in December that Apple's launch of the iPhone 4S has propelled total smartphone sales to 6 million in the first two months of the quarter. That number was just shy of its quarterly record of 6.1 million smartphone sales with a full month still left to go in the holiday quarter. iPhone sales are greater at AT&T, where Apple's smartphone remained exclusive in the U.S. until February of last year when the iPhone 4 came to Verizon. And last fall, the iPhone also came to Sprint, the third-largest carrier in the U.S., as well as smaller regional carriers like C Spire Wireless. Apple will report its total iPhone sales for the holiday quarter this afternoon, when it releases its own quarterly earnings after the markets close at 4 p.m. Eastern, 1 p.m. Pacific. AppleInsider will have full live coverage.